To many, hearing or seeing these words brings thoughts of a lot of $$$$ coming in or going out, not to mention the major headaches hail creates for everyone involved. Many so called roofers and Roofing Contractors swarm to hail damaged roof areas like bees to honey right after a hailstorm occurs. A few are okay, but many are not so good and some are really bad. Many Roofing Contractors have only the thought of a fast buck on their mind. Many are referred to as Storm Chasers. They swoop in, take people's money and are gone. The last thing on their mind is what is best for the Property Owner. By the time anyone, including City/County Building Departments and District Attorneys realize what has happened, the damage is done. Many Property Owners are left with the problems from out and out scams to poorly installed roofs. There is no way of really knowing if your roof is in fact installed properly with the appropriate materials and accessories without having it thoroughly and competently inspected. Problems with roofing materials, accessories, and installations range from minor to major defects, errors, and/or omissions that may not show up right away, but will, maybe months or years later. All roofing contractors, suppliers, manufacturers and general contractors or builders make mistakes. It does not matter how small or large, or how long they have been around, or what their reputation is - they all make mistakes and more frequently than you would think. In the aftermath of hailstorms, Roofing Contractors tend to make even more mistakes. Many have hired new crews to handle the extra work. And then there are the Storm Chasers, many of whom will not install roofing even close to acceptable roofing standards. City/County Building Inspectors are going to be too busy to even perform their normal roof inspection because of the increased number of roof inspections from the hailstorm. Plus most City/County Building Inspectors and Home Inspectors do not have the time, nor the experience in most cases, needed to properly perform a roof inspection even when there has not been a hailstorm. There is only one way to protect yourself and give you Peace of Mind. somebody who really knows the roofing industry. See our web page Roof Inspection Service for more details. Beware of who you are dealing with. Even Local Roofing Contractors in the aftermath of a hailstorm may not be who they say they are. Some so called Storm Chasers have been known to come into town and find local contractors to work with. Some even buyout or lease a Local Roofing Contractor's business or name. They give the owner of a locally known roofing company sometimes tens of thousands of dollars in cash to leave town for a three to six months while they do their thing. Stop! Do not replace your roof now. Property Owners are very vulnerable during this time, feeling the pressure to get their roofs replaced right away, from both their Insurance Companies and the several Roofing Contractors that come knocking at their door. Don't let the pressure get to you. In most cases hail stones only damage the roofing materials causing the roof's life span to decrease greatly. Very few hail stones cause leaks. A Property Owner has time to sit back and let the panic and craziness that hailstorms bring subside. In fact it is in the Property Owners best interest to do so. The Roofing Contractors and their Roofers, Suppliers, and Manufacturer's are all stretched at this time, sometimes beyond their limits. Roofing Installations and sometimes the Roofing Materials are usually not as good as they would be three to six months or more down the road. If the hailstorm damages a large number of roofs in an area, it might even be better to wait six months to a year before signing up with any Roofing Contractor. The Insurance Company's main goal is to get the claims out of their hair as quickly as possible. So they will encourage Property Owners to get the roof replaced as soon as possible. But don't let them bully you. In most cases, your insurance company allows you a year to replace your roof. Check your insurance policy. Yes, you need to mitigate your losses right away but that does not mean replacing the roof right away unless there are many, many holes through the roof that will cause additional damage every time it rains. Most roofs that are leaking can be temporarily repaired or covered. Again, very few roofs need to be replaced right away. Roofing Contractors will also try everything to get you to sign with them. They will promise you the world, tell you the roof is going to fall in on you, say they will be there the next day or week, or if you don't sign up with them now you will not get their special hail sale price, etc., etc. Beware of Roofing Contractor representatives who call themselves Hail Inspectors, Hail Damage Specialists, Hail Repair Specialist, Insurance Inspectors, Insurance Claim Specialists, Insurance Claim Advocates, Hail Experts, Storm Experts, etc. Most are Roofing Salesmen interested only in making the sale. Also, beware of companies who say they will handle your insurance claim and do the roof for whatever the insurance company pays them or the companies who ask you to sign an authorization for them to handle your claim. Most are simply "Storm Chasers" whether they are local Roofing Contractors or from out of town. Historically, the very best time of year to replace your roof is February and March. 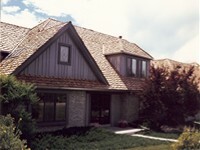 During this time of year you will get the Roofing Contractor's very best price and their best roofing crews. This time of year is the slowest time of year and they are looking for work to keep their best crews busy so they don't lose them. When the chaos has subsided and you are ready to have your roof replaced be sure to check out our website www.roofkey.com for information on how to choose Roofing Materials and Roofing Contractors. See our web pages Roof Inspection Service, Writing a Request For Proposal, Selecting a Contractor, and Roofing Materials.